Today at the Game Developers Conference, Sony senior staff engineer Chris Norden gave a presentation designed to introduce the PlayStation 4 to developers. The talk was mostly technical, but they shared new details about the PS4, including how the augmented reality features will work. 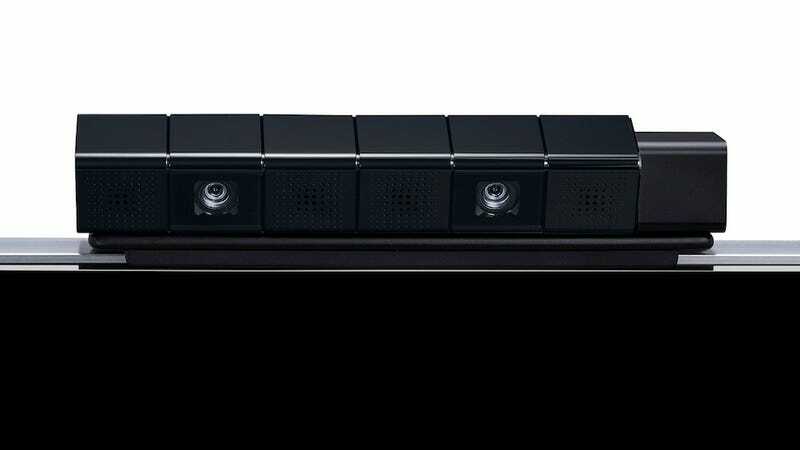 The AR will use the PS4's camera, the PlayStation 4 Eye, in combination with the new DualShock controller, which will combine with facial recognition to let the PS4 identify each player based not only on their controller, but their face. Midway through the talk, Norden showed a demo video of the augmented reality stuff in action. First, we saw a guy in a living room who pulled out a virtually projected menu—we were seeing what he'd see, a reflection of himself on the screen, with the augmented reality graphics projected around him. It then cut to him sitting with a friend, pulling up a digital Pong field, which displayed superimposed over them and their controllers. They then used their controllers to move the pong paddles. The second demo was cooler, and had the guy "zooming in" to his controller with the touch-pad, where the screen showed an army of little robot dudes living inside it. This is similar to an old Ubisoft mini-game that involved little Rabbids creatures seeming to live inside the Wii Remote. The demo also felt a little like those little aliens in Toy Story were living within his controller. Watching them on the screen, he'd press buttons on the controller and see them react as the massive structure above them (which was actually his controller) lit up and changed. When he shook the controller, they all freaked out, and when he covered the touch-pad with his hand, their light source went away. Then, he "flicked" the touchpad and we cut back to a view of him in the room, tossing the robots out of his controller and into the room, pushing them around with his hand before eventually vacuuming them back up, also using the controller. Those kinds of goofy augmented reality demos don't usually get me too excited once they're up and running in my apartment, but as a proof-of-concept for the PS4, the demo was pretty fun. Norden also tossed out a few other ideas that the combination of facial recognition and controller recognition could provide: It'll theoretically allow face-based logins, let the game identify who is talking based on their voice, have characters in the game look out of the TV at the person controlling them (cool), or have the game automatically re-orient multiplayer splitscreen if the players wind up moving around the room mid-session. All little things, but all nifty.